The Pain-Capable Unborn Child Protection Act, introduced by Republican Sen. Lindsey Graham (S.C.), sought to make it illegal for a person to perform, or attempt to perform, an abortion after 20 weeks, punishing those in violation with a fine, up to five years in prison, or both. The bill had broad-based support in the Senate Republican conference, garnering 46 GOP co-sponsors. The House version of the bill passed 237-189 in October. But when the motion to advance the Senate version came up for a vote on Monday, it failed despite a 51-to-46 majority, not reaching the 60-vote threshold to overcome the filibuster blocking the bill's passage. Democrats from red states and swing states that Trump won in 2016 provided the nine votes needed to ensure the measure did not advance through the Senate. Democratic Sens. 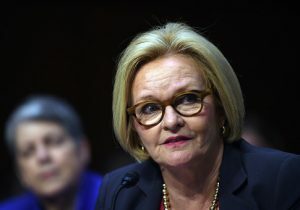 Heidi Heitkamp (N.D.), Doug Jones (Ala.), Claire McCaskill (Mo. ), and Jon Tester (Mont.) all represent safe red states and voted against the legislation. Each lawmaker is up for reelection this year, except for Jones—a newly minted senator who represents a state, Alabama, that voted for Trump over Hillary Clinton by about 28 percentage points in 2016. Alabama also is one of the most pro-life states in the country; a Pew Research Center survey conducted in 2014 found that 58 percent of Alabamans believe abortion should be illegal in all or most cases. Democratic Sens. Sherrod Brown (Ohio) and Debbie Stabenow (Mich.), both of whom are up for reelection in 2018, also voted against the Pain-Capable Unborn Child Protection Act and represent swing states that voted for Trump in 2016. Sen. Gary Peters (D., Mich.) also did not support the bill, though he is not up for reelection this year. The two Democrats who did not cast a vote on the measure also hail from swing states that Trump carried in 2016: Sens. Tammy Baldwin (Wis.) and Bill Nelson (Fla.). Both lawmakers face reelection fights this November. Republican Sen. John McCain (Ariz.) also did not vote, though he been absent from the Senate since early December battling brain cancer; it is unclear when he is expected to return. He supported the same legislation in 2015. Three Senate Democrats did cross party lines to vote for the legislation: Bob Casey (Pa.), Joe Donnelly (Ind. ), and Joe Manchin (W.Va.). All three represent states that Trump carried in 2016 and have announced their intention to seek reelection in 2018. They previously voted in favor of a similar measure to ban abortion after 20 weeks of pregnancy in 2015. Casey received criticism from pro-choice groups and advocates throughout Pennsylvania for voting for the bill on Monday.